According to the manufacturer, this new device “delivers the best mobile performance in its class, for both work and play”. A new system has come to Asustek’s website sporting an AMD Brazos chip, “classy” design and a technology for self-adjusting fan speeds. Reportedly, the new low-power consumption notebook is aimed at business professionals on-the-go and has a starting price of about US $740. The sleek K53U is powered by an AMD Fusion Dual Core (two Bobcat cores) E-350 APU (Accelerated Processing Unit, which is the company’s acronym for a CPU/GPU hybrid device), which has a clock frequency of 1.6GHz and 18W max TDP. Furthermore, the built-in graphics card is an AMD Radeon HD 6310 with shared VRAM. These 40nm-based low-voltage chips are able to process general and 3D geometry, thus, eliminating the need of a discrete graphics controller. When asked back in January of this year, AMD explained that their Brazos technology will be featured in low-power laptops and desktops and would also compete with NVIDIA’s Tegra 2 for a spot on the hot Tablet PCs market. Now, the K53U is definitely not a tablet as it is equipped with a 15.6-inch LED-backlit widescreen panel with a native resolution of 1366-by-768 pixels, and is thus able to offer 720p playback. 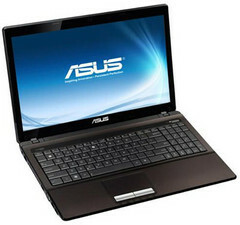 The AMD A50M Chipset-powered laptop ships with either a DVD Burner or a Blu-Ray drive. Customers can purchase the system with up to 8GB of DDR3 1333MHz internal memory and with up to a 750GB mechanical hard drive (and HDD User Password Protection) that rotates at 7200 rounds per minute. You won’t find a USB 3.0 port, even if you look hard. The K53U packs three USB 2.0 ones and comes with a 4-in-1 card reader as well as an HDMI port. Connecting to the Internet and other things should supposedly not be an issue thanks to the built-in 802.11 b/g/n Wi-Fi and Bluetooth 2.1+EDR modules. In addition, an integrated 0.3MP web camera is also available for your video conferencing needs. This new AMD Brazos-powered laptop features a pre-installed copy of up to Windows 7 Ultimate; however, ASUS is apparently recommending Win 7 Professional. Weight is 2.6kg with the 6-cell 5200 mAh battery. Built-in Altec Lansing speakers and a microphone are also part of the standard configuration. As already mentioned, this device is priced at approximately US $740. It will first be released in Japan but is reportedly expected to hit other markets soon.